I fell for a Facebook advertisement. 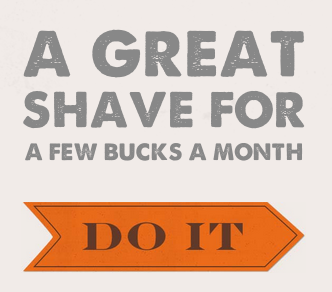 If you are a man, you’ve probably seen the ad on Facebook for the Dollar Shave Club. I finally gave in to the temptation tonight and I’ve ordered a supply of the 4X option. I never thought I would let Facebook influence a purchase, but it happened. The allure of the product was too strong and the investment risk is minimal. I’m hoping for the best. For starters I typically get over one month from the same blade with my current marketing hyped multi-blade cartridge. I do this by keeping the blade dry between uses. After a shave, I make sure to dry the blade by shaking-out excess water and using a towel. Then I store the blade pressed against a silica moisture packet. If you haven’t tried this then I encourage you do so. It’s the secret the blade marketers don’t want you to know. With my existing blades, I can buy 8 cartridges for $26. If I get 4 weeks (conservative with my drying method) from each cartridge then that is 32 weeks for $26. For the 4X option in the Dollar Shave Club I will receive 4 cartridges per month for $6. So for 32 weeks (8 months) my investment is $48. That’s almost 2x the cost as just buying a cartridge locally. However, I’ll have 32 cartridges in that span of time. If I cancel the monthly subscription after 8 months. I should have 24 remaining cartridges in supply which is enough to last me another 2 years! Thinking of it another way my cost per cartridge (also my cost per month) with my existing method is $3.25. With the Dollar Shave Club my cost per cartridge after 8 months is $1.50. Of course this assumes the product works. I bet the blades will be fine. I still can’t believe I fell for a Facebook ad. But I’ll do anything for a close shave. Or maybe I just like squeezing another buck in my favor. Kudos on the product marketing by Dollar Shave Club team. If you want to check out their options and start your own trial then follow this link. I looked more closely at the Dollar Shave Club site today and noticed they have options to lessen the frequency of delivery as well as an option to pause delivery. This is a great feature for customers like me who may want to extend the life of a cartridge beyond a week.